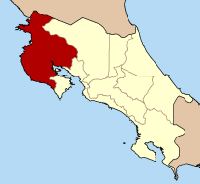 In the northwest region of Costa Rica along the pacific coast lies the Guanacaste province. Beaches, mountains, volcanos, world-reknown surfing, fishing, an international airport in Liberia (Daniel Oduber International Airport) and many luxury hotels and resorts. The province is named for the guanacaste tree, also know as the ear pod tree. This is the national tree of Costa Rica.